When a person puts their mind towards accomplishing a goal, whether or not they achieve that goal all comes down to that individual. There are a few factors that one must possess in order to have the courage to pick themselves up after being knocked down, repeatedly. The characteristics that I'm referring to may remind you of a few people that you know of in your own life. This nominee embodies the entire meaning of being a survivor. In all the sense of the word; a champion, a fighter, a hero. When you look past the thick skin, you'll find a dedicated person of faith, honor and respect all the way to their core. As if failure is not an option. To hit a rough patch in life is an understatement for Chris Andersen. Born during the early 50's in Denver, Colorado he explains that his upbringing was slightly bitter-sweet. Raised by a loving mother and a strict father, his childhood was a roller coaster of many highs and lows. Mostly on the downward slope. With each obstacle he faced growing up, every outcome, small or large impacted his way of thinking. This allowed him the opportunity to strengthen his integrity and obedience for the tough times ahead. Many of his fondest memories included both of his grandfathers. "Everyone should be proud of who they are and where they come from," is how Chris led me into the introduction of the two most influential men in his childhood. "My grandfather on my dad's side was an immigrant from Denmark. He was a blacksmith... a real man's man." As a young, impressionable soul, Chris paid close attention and absorbed every bit of their work ethic. To this day, he continues to display the traditions he learned many years ago in his every day activities. He was taught to work hard, earn respect, and trust that everything would work out through the power of prayer. Looking back at all of his struggles and blessings, the one thing that remained consistent is his positive spirit. At the age of three, Chris's family moved to Iowa and in 1969 they landed in Arizona. He described himself as a city boy with Mid-West values. As Chris bounced around memories, like they were from yesterday, he draws me in. I'm curious, but he's quick to push away any sympathy. "Nothing was given to me. I was taught what it was like to work before I was eleven. I grew up fast." During school, he played sports as a typical student. He was a part of the wrestling squad and a defensive end on the football team. After he graduated from Scottsdale Arizona High School, his attention turned toward the dirt track. By 19, he was stock car racing. When he wasn't driving full force, he was working full time. "It was nothing for me to have two or three jobs at once. So the way I did things, I worked hard and played hard." How he was able to juggle all of this, I have no clue. Then again, this is a man that has overcome more in his lifetime, than an entire bus full of passengers. In 1973, after obtaining his chauffeurs license he went to work in Phoenix for a local air freight company at the main airport, located in Sky Harbor. He had a variety of duties ranging from on and off of the airport making pickups and deliveries. In time, Chris eventually worked his way up to a position behind the wheel of a 26ft. bobtail. A few year later, Chris took a job at a performance parts shop while still pursuing his passion for driving at night. When the opportunity presented itself, Chris took full advantage and started driving full time. He began driving tractor trailers around the airport making deliveries to the airlines. Next thing he knew, he was running 2,800 miles a week throughout town delivering locally. It was during this time, his stock car racing was put on the back burner. His new interest was in custom painting. A good friend that was in the business introduced Chris to the craft and showed him the tricks of the trade. It didn't take long before he was hooked. To start off, he rented a garage in town and worked out of it. Then he moved up to a commercial building on the south side of town, which unfortunately burned down six months later. With everything lost in the fire, Chris went back to what he did best, driving. As an owner operator, Chris teamed up with a close friend and together they ran freight out of Sky Harbor Airport for the following six years. Before he completely closed the door on his dream of being a professional race car driver, he had one more wish on his bucket list to carry out. He enrolled into Duke Southard School of Racing, also known as the boot camp for auto racing. This 5-day class is aimed at the more serious racer, rather than the adventure-seeker. In turn, producing results for some of the most successful race car drivers in the field today. Of the twelve students, including himself, Chris finished as one of the top two. Having confirming his assumption that if he financially could venture down that road, he very well could be a top contender. That was enough for him. In 1980, Chris sold his stock car and checked that box as complete. When Chris purchased his first truck, he poured all of his learning skills into it. He opted to go old school and totally repainted, rebuilt, and redesigned it for his taste. It was a 1968 Peterbilt that took him two years to get it just the way he wanted. Over the years, Chris made it a point to build his working career with a solid reputation. "I wanted people to know that when I'm working for them, they're getting the best service possible." Having his own authority since 1988, he began earning the trust of many and now hauls for a collection of businesses. He joined the trucking company, Anderson Trucking Service (ATS) as a part of their brokerage division twenty years ago. He prides himself in having a perfect driving record with no tickets. In 2003, right before the Thanksgiving holiday, it was during a regular DOT physical when Chris received some alarming news. A red, sore spot in his mouth on the right side of his gums caught the attention of the physician. After that moment, everything seemed to be in fast forward. He was diagnosed with stage 4 terminal throat cancer and given a prognosis that he refused to accept. This type of cancer normally targets smokers. Being that Chris is not a smoker and he considered himself healthy, the news caught him and his wife, Murray off guard. The couple handled the doctor's report the only way they knew how... with lots of prayer. They decided to put all of their affairs in order. Chris sold his truck to a Kenworth dealership, purchased a truck that was 'good enough to get the job done.' After saving enough money to pay their bills for when Chris began his treatments, they were ready. It was immediately after Christmas, Chris spent two months of enduring radical radiation and chemotherapy. After 40 sessions and loosing over 100 pounds, the cancer went into remission. Chris stated, "After I had gone through with my treatments, I fought my way back!" He was soon back in the seat of his truck, running as much as possible to get his family to where they were before this disease drastically invaded their lives. About a year later, on an ordinary day in Indiana, Chris looked in his rearview mirror and caught a glimpse of a truck. In that very instant he knew what he had to do. With a sense of desperation, he was able to get the driver to pull over and the two had a quick conversation about the stranger's truck. The 2000 W900L purple Kenworth looked all too familiar to Chris. It surprised the driver when Chris announced that he was the former owner of his truck, but it was his response that took the cake. "He told me, 'I thought you were dead!' And I said, Ya know, that's what everybody keeps telling me." After some more talk, the two guys worked out an agreement and by the end of that year Chris was back in his truck. Just when things seemed as if they couldn't get any better, another turn of events took place. In 2009, Chris's grandchildren submitted his information to have his truck on a television show, Trick My Truck, featured on CMT. 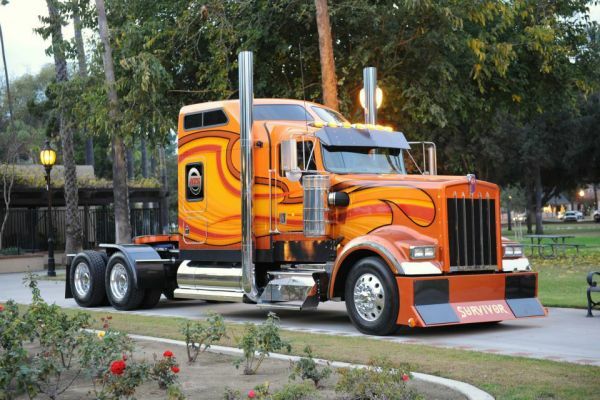 The show is known for "stealing" big rigs and returning them to their owners after the creative mechanics have completely customized the trucks to their fullest and wildest dreams. Chris's truck was one of the eight selected out of 250. He shares with me the denial that went through his mind when he was first contacted. "When I answered the phone the first time, I thought it was someone playing a prank on me. Then my wife called me, saying that they called her too. It was crazy! I just couldn't believe it." He explains that the day of the big reveal was equivalent to him winning the lottery. 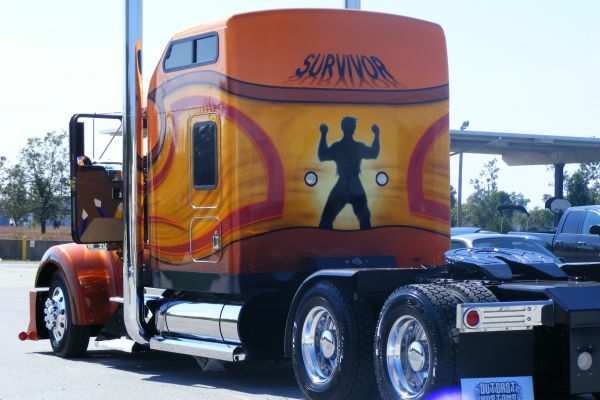 The guys from Trick My Truck named his custom designed big rig after its rightful owner, Survivor. You can still view his episode on their website that aired on April 18th, in 2009. These days you can catch Chris at any truck event, raising awareness for cancer. You can also guarantee, that you will see his Survivor truck nearby. However, Chris's roller coaster still continues at the present time. He is recovering from cancer and doing well. He mentions of a dream that he had after he first turned the corner on beating cancer. It was then when he realized his passion and fight would be for the children of our country battling cancer too. He only has a few things left on his bucket list, but his main wish is to do a benefit for the kids at St. Jude Children's Hospital. He understands the strength one must have to overcome life's hardships. With endurance and fearlessness he says, "You may be in this for the fight of your life..." Being a cancer survivor myself, he pulls at my heart with his next simple words, "... but don't give up. Don't give in. Roll on!"